Days: Wednesday. Event Types: Author Signings. Sectors: Author. Subjects: Adult. Melissa Nightingale, author of How F*cked Up Is Your Management, will be signing in MTCC 206AB on Wednesday at 10:15 AM. 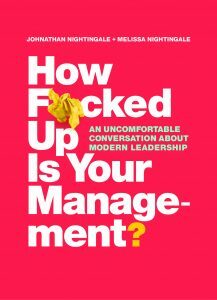 How F*cked Up Is Your Management tackles a massive gap in the conversation about modern leadership. Through personal narrative, and candid storytelling, Melissa and Johnathan Nightingale distill the lessons they’ve learned and the mistakes they’ve made into a new management standard.